One of the things I got in my farm share was a big ol' bunch of rhubarb. I looooove rhubarb. It grew dang near wild where I grew up. But, I wanted to try something more special than a simple strawberry rhubarb pie. I made one with almonds and one without, since some members of my family are less fond of almond than I am. And Oh. Em. Gee. 1 can almond pastry filling. In a medium mixing bowl, combine brown sugar, preserves, and vanilla until pasty. Toss rhubarb in and stir until fabulously coated. Leave out to marinate. In a large mixing bowl, combine flour and salt. Then add in butter. Mix with your fingers until sand-go past the stage that you would want for a crumble. Pull out two squares of tin foil, about the size of a salad plate. Place each ball on a piece of foil. Form a rectangle, and then loosely wrap, and refrigerate for an hour. About 40 minutes into the hour, preheat your oven to 400F, and find your large baking sheet. Cover with parchment. Hour is up, pull out tarts, and quickly pat into rectangles on the parchment. Prick holes with form all over bottoms. Smear one tart with almond filling, then arrange rhubarb on top. 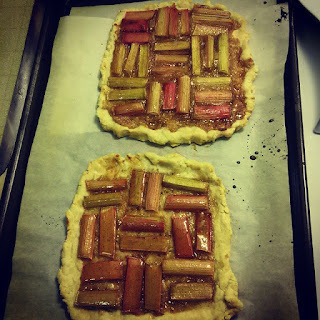 You can leave the other tart bare and arrange the rhubarb on it, or also smear with almond filling. Sprinkle equal parts of the remaining vanilla sugar mix on top.